Forget the days when having a cavity restored meant leaving the dentist’s office with a noticeable silver spot in your mouth. Tooth-colored fillings from your dentist in Fayetteville are an aesthetic and biocompatible alternative to silver dental work. Dr. Ruff uses white composite resin to restore existing cavities, repair minor damage, and replace old gray fillings. Learn more about this popular cosmetic option today. Why Choose Ascot Aesthetic Implants & Dentistry for Tooth-Colored Fillings? Tooth colored fillings are made of biocompatible composite resin, a blend of smooth plastic and glass particles. With the help of a precise color guide, composite resin is highly customizable to match the shade of the surrounding teeth. Unlike silver fillings, white fillings are virtually undetectable after placement. How Do White Fillings Compare to Silver Fillings? White fillings leave more of the natural tooth structure intact than is possible with silver fillings. Because composite resin does not contract and expand in response to heat and cold like silver fillings, they are less sensitive. That means they can last longer than amalgam, too. Composite resin also dries within minutes under a special UV light -- but silver fillings may take up to 12 hours to fully set. And because composite resin actually bonds with the tooth, white fillings restore 85 to 90 percent of the tooth’s original strength. For their numerous benefits and long-lasting results, more dentists across the country are choosing composite resin over dental amalgam for repairing tooth decay and damage. What Are Tooth Colored Fillings Used For? In addition to filling new cavities, your dentist can replace your old silver dental work with composite resin. 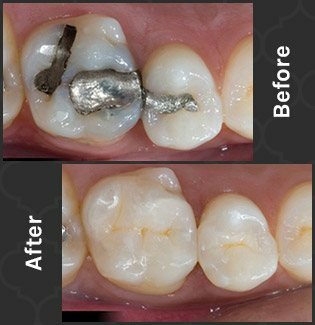 While silver/amalgam has been FDA-approved for use in dentistry, some patients choose to have otherwise healthy fillings replaced to remove the risk for mercury exposure with dental amalgam. Composite resin offers a safe, metal-free alternative. Silver may also make it difficult to spot further decay and damage around the filling in years to come. FIlling replacement is a simple procedure that could potentially save you a significant amount of time and stress in the long run. The same material used in tooth colored fillings can also be used to repair minor cosmetic imperfections in just one visit to the dentist’s office. Known as cosmetic bonding, it is a fast, affordable alternative to lengthy cosmetic procedures. There is no need for anesthesia with the painless procedure. Minor chips, small gaps, discoloration, and short or stubby teeth are artfully enhanced with the customizable composite resin.